Sometimes the thing you’re supposed to do with your life doesn’t become clear until life itself pushes you toward it. So it was for Miguel Bernard-Rivera for most of his 47 years. As a kid growing up in Jersey City, he would bake cakes and pastries that his mother would take to church (and sometimes, he jokes, try to pass off as her own). He cooked through his years as a bookstore manager in New York, as a night auditor at a Burlington motel and as a lobby coordinator at Fletcher Allen Health Care. And, 12 years ago, when he fell in love with a man whose system wouldn’t tolerate the slightest hint of gluten, Bernard-Rivera upped his cooking game by plunging into the world of gluten-free foods, then notorious for their crumbly texture. He figured out how to “break their code” and make them better. But he rarely considered turning that passion into a vocation until last spring, when Bernard-Rivera finally decided to become Chef Papi, a jovial baker of gluten-free cakes, cookies and tarts. And he isn’t looking back. 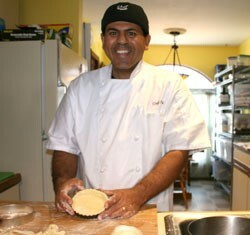 “I always thought I had the talent, but I didn’t have the courage to go for it,” says Bernard-Rivera as he rolls out some puttylike tart dough on a recent afternoon, occasionally glancing out his back glass doors at a view of Lake Champlain and the Adirondacks. He deftly cuts the rounds into perfect circles, nestles them into tart pans and loads bright-red raspberries in their centers. Nearby, stacks of fresh-baked lemon-cherry tarts sit ready for delivery to City Market, one of the many clients he’s picked up in the past year. “You just put your name out there, and you do your best,” says the stocky chef, who has intense dark-brown eyes that almost vibrate against his chef’s whites. I first tasted Chef Papi’s creations at the South Champlain Street offices of the Champlain Valley Office of Economic Opportunity (Seven Days’ neighbor). Bernard-Rivera had arranged a kaleidoscopic display of tiny muffins, chocolate cupcakes and star-topped tarts for the agency’s open house; each bite was so moist and rich that I was shocked to learn it was all gluten free. During a visit to his kitchen a few weeks later, Bernard-Rivera reveals how he unlocked the secrets of wheatless pastry. It turns out the road to becoming a gluten-free chef was long and paved with a few experiences that were anything but sweet. Though he excelled in high school and headed the student council, about a month before graduation Bernard-Rivera ran away to the streets of New York City, just across the river. He knew he was gay, and there was no way he could reveal that to his family. He just needed to find himself. So, at age 17, Bernard-Rivera got his first taste of hardscrabble street life, sleeping rough for a few weeks until he scored a job selling shoes at a midtown department store. Though he suspected his new boss knew he was homeless at first, the boss didn’t mention it. Bernard-Rivera received his first paycheck a few days early, along with subtle kindnesses he has never forgotten. “When you’re trying to help yourself, people step forward to help you,” he recalls. It’s something he would notice again and again throughout life. Bernard-Rivera eventually reconciled with his family and went on to manage a bookstore in Manhattan. In his thirties, he began seeing a Vermonter, and, after that man’s death, Bernard-Rivera decided to move north, to a place of which he had grown fond. Initially, he found an $8-an-hour job as a night auditor at a Motel 6. When his living quarters fell through, he borrowed a yellow tent and set it up in a campground in the New North End. He also found his way to the Chittenden Emergency Food Shelf for sustenance. The place would later figure hugely in his life. Bernard-Rivera eventually found a place to live, a better job (at Fletcher Allen) and a boyfriend — Ron Bernard — whom he would later marry. Early in the relationship, Bernard-Rivera learned that he couldn’t so much as bring regular flour into the house, because it could waft into the air and enter Ron’s lungs. Yet as the nascent chef sampled and explored the growing number of wheat- and gluten-free foods, he quickly realized he had ventured onto a dismal tundra of dry breads, crumbling pastries and cardboard-like pizza dough. He recalls some of his own cornmeal-heavy efforts at gluten-free fare as “awful. “But I was determined to create something everyone would like — not just because you might have celiac or be on a special diet, but just because it was good,” Bernard-Rivera says. So he played endlessly in the kitchen, using Ron as his guinea pig as he nailed down recipes. Bernard-Rivera’s pastries had become popular among friends, and the long-simmering idea of his own business began to reach a boil. He bought and analyzed dozens of gluten-free products, trying to figure out why certain ones didn’t work, why others did and how he could make them better. Bernard-Rivera zeroed in on chocolate cake and cookies, feeding his experiments to Ron and his two stepdaughters, Laura and Jessica Bernard. “I reverse-engineered the recipes, learned how things work and bind. I was throwing away dozens of cupcakes. But I was getting better at it,” he recalls. Bernard-Rivera also created gluten-free tarts and muffins, some of which he initially sold at Winooski’s Block Gallery and the Winooski Farmers Market. He designed his logo, figured out packaging, learned about the shelf life of his products, and began doing deliveries and accounting. Just a year after starting his business, Bernard-Rivera now bakes three days a week, beginning at 6 a.m. In addition to preparing his regular line, he’s constantly trying to improve. “I research the recipes, and I keep playing with them. I’m always building, figuring out how to get from A to B better and quicker,” he says. He recently spent a week perfecting a gluten-free, vegan cinnamon roll for Dealer.com, where he’ll be giving a cooking class this April. After Bernard-Rivera slides tarts into the oven, he rounds his hands above his belly to demonstrate its previous girth, noting how more conscious baking and cooking have improved his health. “Nobody likes to diet,” he says. “But by making better choices, I got healthier.” Simple kitchen fixes — such as using coconut oil instead of butter for frying — can have a dramatic effect, he says. As can avoiding gluten. “I don’t really miss wheat, but when I go out with friends, sometimes I stock up,” he says with a laugh. He also keeps a secret stash of Oreos on a top shelf in his kitchen. The still-warm tart is proof he’s ironed out those mistakes. Each warm bite is a little piece of heaven.